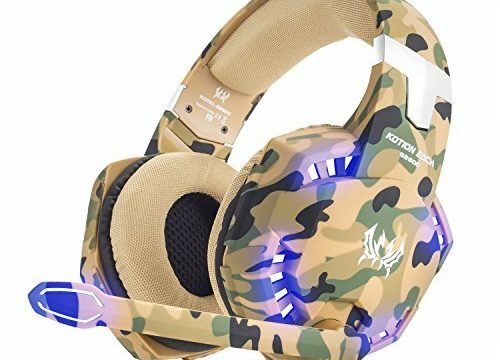 【COOL STYLING】 Unique camouflage patterns & metal lock combining with the glaring LED lights designed on the ear cups and microphone make this item extremely eye-catching and custom-built for gamers. 【FOR GAMERS】 Crystal-clear sound built-in high precision 50mm magnetic neodymium driver for a more immersive experience; The omnidirectional noise reduction technology ensures that microphone picks up your voice clearly in-game or online chat. 【MORE COMFORT】 Aesthetic in-line controller including volume control knob and one key mic mute button is super convenient for game playing; Skin-friendly ear pads and elastic cotton pad for head protection make it a great helper for long time playing. 【WHAT YOU GET】 VersionTECH. G2600 gaming headset, multi-language user manual, our worry-free 12-month warranty and friendly customer service.